SINANCHÉ, Mexico, Mar 6 2013 (IPS) - The residents of San Crisanto, a small communal village nestled in an idyllic setting in the southeastern Mexican state of Yucatán, have learned that valuing and protecting natural resources can generate employment and income. The San Crisanto initiative, which combines ecotourism and other economic activities, is a model for other communities located along Mexico’s Caribbean coast, which is rich in biodiversity but exposed to unpredictable weather hazards. Visitors to San Crisanto can take boat tours, swim in the crystal-clear waters of “cenotes” or sinkholes, stay in environmentally friendly “eco-cabins”, and purchase locally produced crafts and sweets made from coconuts. In 2012, the community received 12,000 visitors, although it has the capacity for 50,000 annually, according to the residents. In addition, “we work a great deal on education. The majority of the people are very much aware of the importance of taking care of the natural resources. We must take care of them because of climate change, to protect them from hurricanes,” said Reyes Cetz, 44, one of the 35 registered landholders in the “ejido” or communal village of San Crisanto. There is as yet no incontrovertible scientific proof that the extremely powerful and destructive hurricanes of recent years are caused by climate change. But it is highly probable that atmospheric warming has had an impact on the intensity and frequency of extreme weather events. In 1995, Hurricanes Opal and Roxanne devastated the mangrove forests of San Crisanto, located 1,400 kilometres southeast of Mexico City. First the residents organised to repair the damages. Then they proceeded to strengthen the ecosystem against future threats by clearing channels through the mangrove, to allow water to flow through freely. 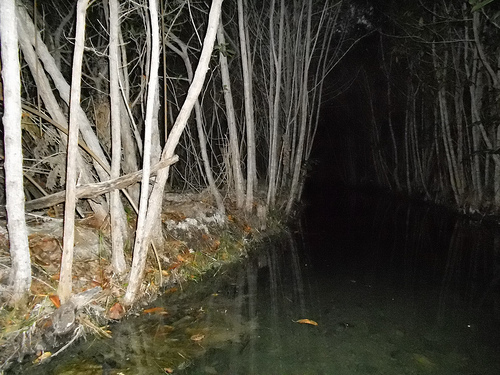 “The mangrove forests recovered quickly, because the water currents carried nutrients to them. The more mangrove forests there are, the more birds, fish and crocodiles there are,” said José Loria, 56, the operations manager of the ejido, which created the San Crisanto Foundation in 2001. The ejido system dates back to the Aztecs, and was re-established in Mexico in the 1930s. It is based on the communal tenure and farming of public lands. The San Crisanto ejido was established by a group of farmers who requested land from the state government for growing coconuts in 1957, although its creation was not authorised until 1973. The community jointly holds 850 hectares of mangrove forests and 100 hectares of coconut groves. In addition to ecotourism, they use these communal resources for agriculture, craft production and salt extraction. The average income of each “ejidatorio” or communal landholder is 6,000 dollars a year, earned from ecotourism, salt extraction, and payments for environmental services like reforestation and protection of the mangrove forests. These various activities provide employment for 300 people. “During these months – between February and May – we concentrate on extracting salt and preparing for the tourist season,” Cetz told Tierramérica. This year they have already produced 250 tons of salt, which the ejido sells for 39 dollars a ton. Since 2001, the community has restored 11,300 metres of canals in the mangrove forests and 45 cenotes fed by underground water sources. While these efforts have reduced the risk of flooding, they have also led to growth in the populations of endemic species. The area around San Crisanto, home to 570 habitants, is exposed to hurricanes and storm surges caused by an increase in sea level, which means there is an urgent need here to adapt to weather variations. But the state of Yucatán, highly vulnerable to these problems and extensively studied by scientists, has still not developed a plan to confront climate change. Mexico loses 10,000 hectares of mangrove forests of year. There are currently more than 770,000 hectares of these coastal ecosystems remaining in the country, according to the National Commission for the Knowledge and Use of Biodiversity (CONABIO). If the current rate of destruction continues, by 2025 Yucatán will have lost almost 30 percent of the mangrove forests it had in 2010, according to projections by the National Institute of Ecology and Climate Change. Mangrove forests, made up of numerous tree species adapted to swampy, saline soils, provide a habitat for a wide range of fauna, serve as a natural water filter, and protect coastal areas from storm surges, hurricanes and erosion. As they grow, the trees absorb large volumes of carbon dioxide. Their destruction in Yucatán is largely the result of urbanisation and the expansion of tourism, particularly the hotel industry. Other threats include pollutants from fertilisers, pesticides and wastewater that are washed into the mangroves by rivers and streams. In this region “there are two fundamental elements” that need to be protected: the coastal barriers provided by coral reefs and mangrove forests, said Lorenzo Rosenzweig, executive director of the non-governmental Mexican Fund for Nature Conservation. “The best way to protect the coasts is to protect the mangroves,” he told Tierramérica. The Mexican NGO participated in the creation of the Mesoamerican Reef Fund, established in 2004 to protect the coral reefs off the coasts of Mexico, Belize, Guatemala and Honduras, and between 2009 and 2012 it designed adaptation programmes for four ecosystem areas in southeast Mexico, including the Caribbean coast. The success of San Crisanto’s efforts has attracted national and international attention. In 2010, the United Nations Development Programme awarded the community its biennial Equator Prize, and the following year, it received a national prize for forest conservation. The community has also been the subject of a study, “Campesinos-pescadores de Yucatán: uso de la biodiversidad y apropiación de recursos naturales costeros” (Peasant farmers-fishers of Yucatán: Use of biodiversity and appropriation of coastal natural resources), published in 2010 by Luis Arias and Salvador Montiel of the Centre for Research and Advanced Studies at the National Polytechnic Institute. The study identified 144 species used for livelihood purposes in San Crisanto and noted that ecotourism has become the leading economic activity, due to both the revenues it brings in and the “social recognition” that it earns the community. The ejido’s strategic plan for 2009-2029 foresees an increase in this trend. “We see ourselves as a community that lives from tourism,” said Loria. “We need to diversify and improve our offerings, to reach a bigger market,” he added.